Indian Premier League 2019 (IPL 2019) has become a ritual for almost every Indian, which needs to be performed every day in India. Yes, it has touched the new hight in the country of more than 1.3 Billion population. The ongoing season of IPL is just about to complete its phase, in which every team play seven matches. Today on April 10, the 24th match will be played between Mumbai Indians (Mi) and Kings XI Punjab (KXIP). Before diving into the details of Mi vs KXIP Live Streaming, start time, IPL Point Table and live score of today’s match, let’s take a look at the 23rd match of this IPL CSK vs KKR. On April 9, we had witnessed almost one side match. Yes, KKR who chased down the 139 targets against Rajasthan Royal on this Sunday and won by 8 wickets could only manage to score 108 runs. Yes, Mahindra Singh Dhoni-led CSK easily achieved the target and won the match by 7 wickets. Mahendra Singh Dhoni’s player performed outstanding and got back to winning ways and topped the Point Table again. Today’s MI vs KXIP IPL cricket match will be broadcast at 08:00 PM onwards. MI vs KXIP live streaming or live telecast can be watched free on Hotstar and Jio TV, Airtel TV. You can follow all the ball-by-ball updates and live commentary with analysis on our live blog. Notably, the live telecast of Today’s IPL cricket match will be available on Hotstar app and website. Fans can click here, for RCB vs DC live score updates. 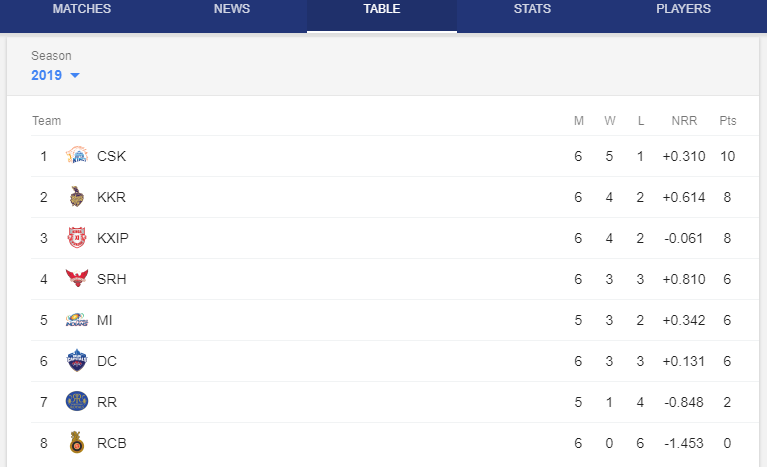 Chennai Super Kings (CSK) has once again earned their playback on the top of the IPL 2019 points table. MS Dhoni-led CSK has won five out of six matches and became the first team of this IPL to achieve 10 points. The second position in this IPL point table has been bagged by Kolkata Knight Rider (KKR) and followed by Kings XI Punjab and Sunrisers Hyderabad. Can I watch the KXIP vs MI Live Streaming for free? The BT Sport trail version will allow you to watch all of the BT Sport channels via their app while casting to your television is also included. If you are thinking your money will be deducted once I enter the credentials, you should note that you can cancel the trial at any time. You just have to type another message STOP SPORT and send on the same number.